Yeah, this is what happens when I let Andrew write. The inside of his skull is crammed with pop-culture ephemera of all descriptions. 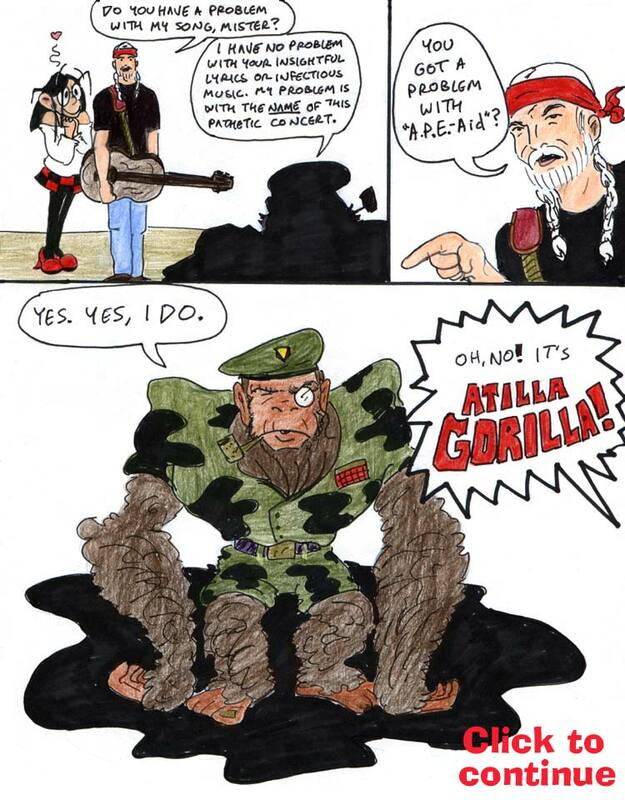 This comic was created to advertise the table we were sharing at the Alternative Press Expo. Andrew wrote it, we drew it together (although Andrew drew most of it), and I colored it. Can you believe we weren’t dating yet? Truly, it boggles the mind. This is what the inside of Andrew’s head looks like ALL THE TIME. 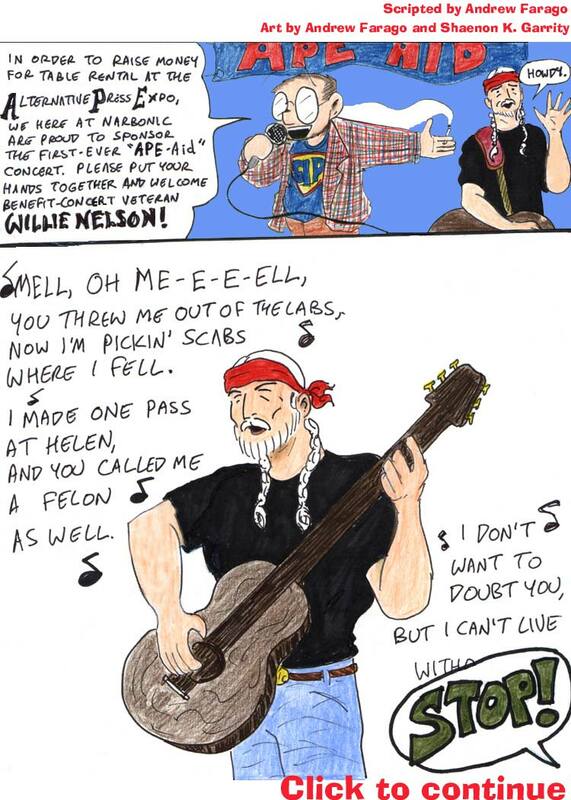 I love the flames coming off Willie Nelson’s fist in the second panel. Andrew’s got a knack for Drawing Comics the Marvel Way. He also came up with all the awesome ape names. 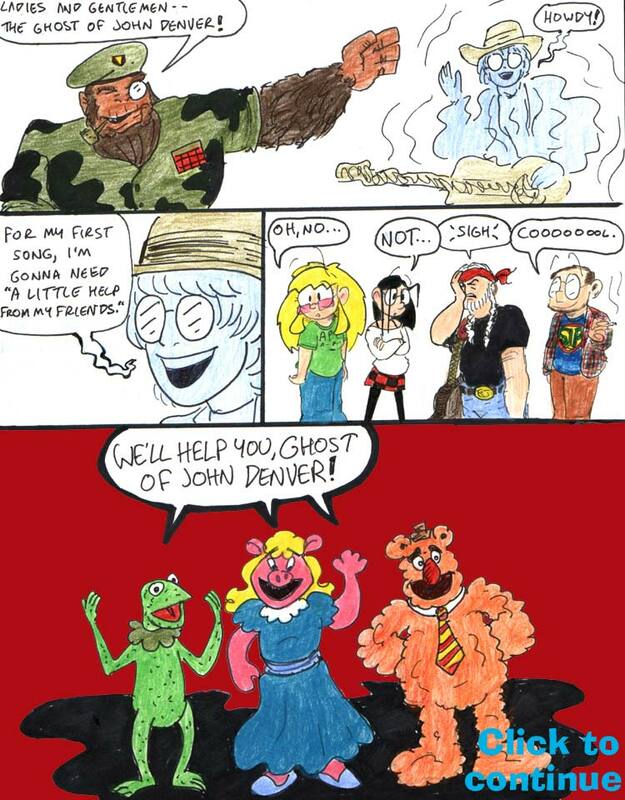 Andrew was displeased with my coloring on this page because I colored the Muppets correctly. They’re supposed to be off-brand Muppets, so it would’ve been better if the colors had been all wrong. Oh, and Dave’s t-shirt is a Strangers in Paradise superhero logo, because creator Terry Moore was the guest of honor at APE that year. This is the greatest thing in the history of the universe. Cyna Bon was a comic Andrew was working on with another artist, a woman he met on Craigslist. He drew about a hundred pages of it, mostly in Sharpie. 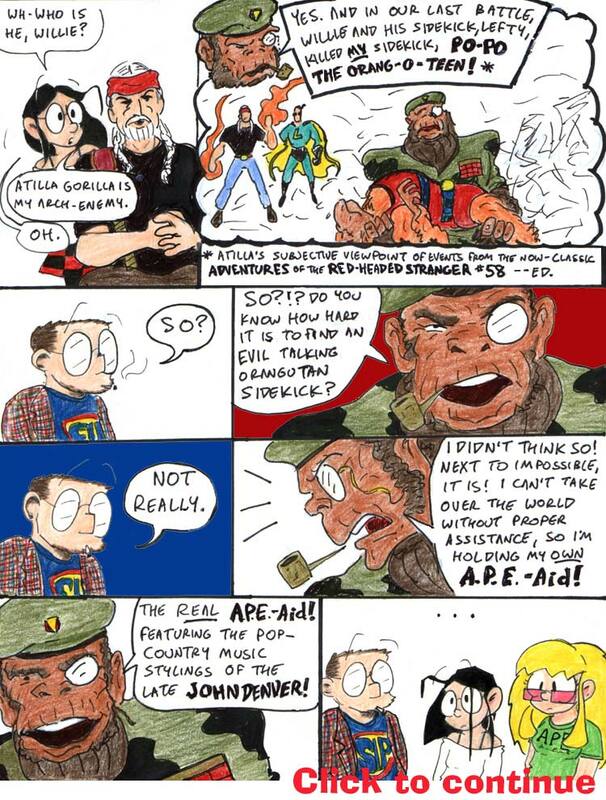 Then he and his collaborator parted over creative differences, and I don’t think it ever got published in any form. Andrew seems to have reworked some of his Cyna Bon concepts into William Bazillion, though. Keith Knight did indeed bring cookies. The Cartoon Art Museum’s restroom stall is a stall rescued from the original location of Comic Relief, the great Berkeley comic-book store. It’s covered in graffiti by cartoonists who visited Comic Relief in the early days. It’s pretty rad. At the time of this strip, the museum was displaying the stall as part of an underground comics show. It’s in storage now; it’s kind of hard to display. And what better way to crown off this hggreyl ergneqrq episode than a giant fight cloud. 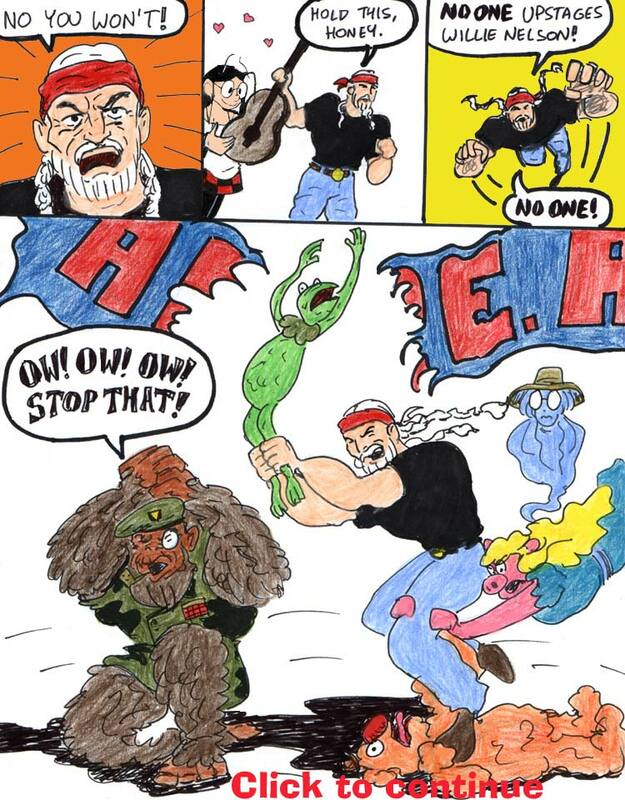 If you have enjoyed this completely logical episode of Narbonic, you might also enjoy the wit of this Sluggy Freelance arc (link goes to final strip). I could tell my children I saw Shaenon once… if I had any. The amazing thing is that it was a business trip, so most of my expenses were paid. Stuffing bags for two hours paid the rest of them. Dang, I utterly don’t remember this from the original run.